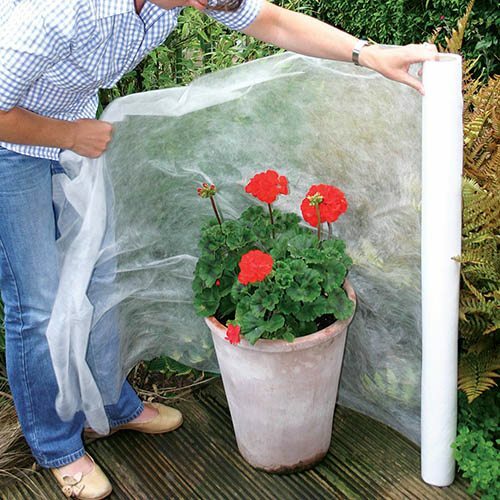 Protect larger and valuable tender plants with ease this winter! Breathable - will allow water to move in and out of plant. Allows light in and keeps Insects out! Supplied as a roll - 1.5m x 8m. Cut to required size. Measuring 1.5 x 8 metres, it will be enough to cover many of the tender plants in a small garden. It will cover large trees and shrubs with ease. It could not be simpler to use; simply cut the exact amount that you need from the roll and tie or staple it snugly round the plant you need. The breathable fabric allows water to move in and out from the plant, yet lets light in, so it can continue to grow perfectly normally. It also acts as a physical barrier to insects too. You can leave it on for several months over winter with no ill effects. 1.5M x 8M roll Ready to use. Cut to required size.